The Goblin Giant card is unlocked from the Jungle Arena (Arena 9). He is a building-targeting, melee troop with high health and moderate damage. He also carries two Spear Goblins on his back, that can attack independently of the Goblin Giant. When he is taken down, the Spear Goblins emerge and continue attacking. A Goblin Giant card costs 6 Elixir to deploy. Using a second unit to tank for the Spear Goblins after the Goblin Giant is defeated will allow them to stay on the field longer and deal more damage. Using Zap on a defending Minion Horde will allow the Spear Goblins to easily finish the Minions off. The Goblin Giant's unique ability to move and attack in separate patterns allows him to kite units while simultaneously dealing damage to them. 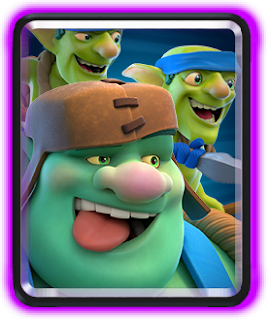 The Goblin Giant's medium speed, high health, and decent damage allow him to be a powerful solo troop to rush towers with. The Goblin Giant is a poor heavy tank. His health is low relative to Giant and Golem, his higher speed prevents Elixir banking, his cost is high, and his ranged chip damage is useless in heavy pushes. The Goblin Giant was released on 5/9/2018.